“I never thought I would get cancer. I never, ever thought it was possible. It doesn’t run in my family, and I didn’t feel a lump,” says Diana Muehlhausen, 65, of Rio Vista. ABOVE: Diana Muehlhausen and husband, Jay, signal OK and Zero for how she’s feeling and the fact that she’s cancer-free, thanks to diligent follow-up care by her diagnostic and breast cancer surgical team. But suspicious, small lumps did show up in her left breast on her regular mammogram, so the diagnostic imaging team at NorthBay Healthcare contacted Diana to return for a second and even a third image in late June. The specialist was Jason Marengo, M.D., oncoplastic surgeon at the NorthBay Cancer Center, and he explained that Diana’s lumps, although at Stage 0, were in fact a kind of cancer that had worrisome characteristics. She was scheduled for a lumpectomy and from this point on, Diana would now have access not only to cutting-edge technology at the NorthBay Cancer Center, but also to Dr. Marengo’s specialized training in breast reconstruction and conservation techniques. Having him teamed with Brian Vikstrom, M.D., her oncologist/hematologist, so early in the treatment regimen is unique to cancer care, not only in Solano County, but within the greater San Francisco Bay Area and Sacramento Valley, according to Lori Muir, director of Oncology Services for NorthBay Healthcare. Diana also had access to a new tool in NorthBay Cancer Center’s arsenal to help women prepare for their breast cancer surgery, called a Savi Scout Wire-free Radar Localization System. Breast cancer surgery may be used alone or in combination with other treatments, such as chemotherapy, hormone therapy, targeted therapy, immunotherapy and radiation therapy, and all can be performed right here in Solano County at NorthBay Cancer Center. Having an oncoplastic surgeon on staff means patients will have access to even more options for treatment to remove tumors while sparing healthy tissue and preserving the breast’s most natural shape. This system allows Dr. Marengo to more precisely locate the tumor — or tumors, in Diana’s case — and remove them while sparing healthy tissue and preserving the breast’s most natural shape. Diana’s surgery, held in mid-August, was successful, and not only did she have the worrisome tumors removed from her left breast, as well as some lymph nodes, but Dr. Marengo also performed breast reduction surgery on her right breast so that she would have improved symmetry. By the end of 2018, she had completed radiation and was looking forward to traveling in the new year, and a home remodeling project. In reflecting on the experience, Diana was grateful for the care that was available relatively close to her Rio Vista home. Diana also had some advice for others. It’s important for surgeons to find the exact location of cancerous cells that will be removed during a lumpectomy. During the surgery, surgeons are typically guided to the tumor by following a wire that has been inserted inside the breast during a procedure called wire localization. The wire is typically localized on the morning of the surgery by a radiologist. This can cause extended discomfort for the patient. 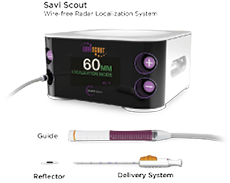 NorthBay Healthcare recently acquired the Savi Scout Wire-free Radar Localization System, and it doesn’t use wires, but instead uses a small, 1 cm reflector to guide the surgeon to the lump. This reflector is inserted into the lump by a radiologist, and the surgeon will locate it using a hand-held device that emits a tiny radar signal. Precision in locating the tumor may increase the probability of complete cancer removal, which also reduces the chances of needing a second surgery. The reflector can be implanted sometimes up to 30 days before the surgery, so there is no waiting on the morning of the surgery.